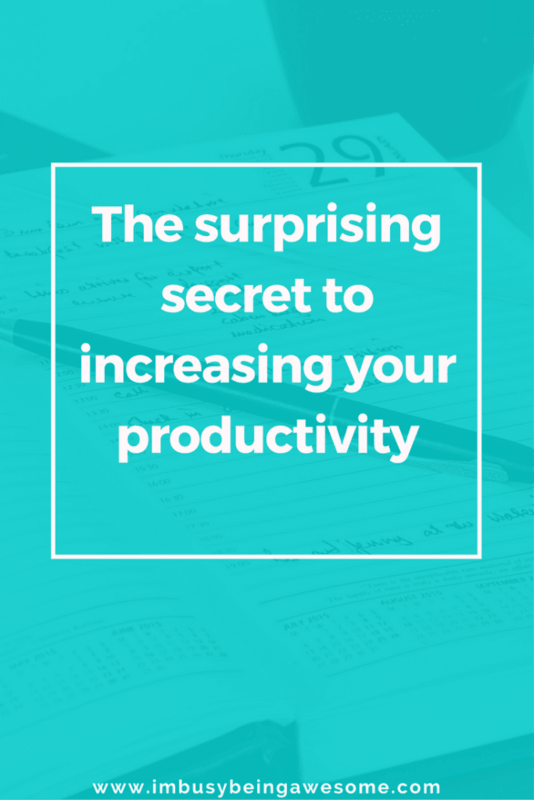 If you’ve been reading my blog for a while now, you know that I am all about productivity. I love making the most out of my time and plowing through my to-do list. 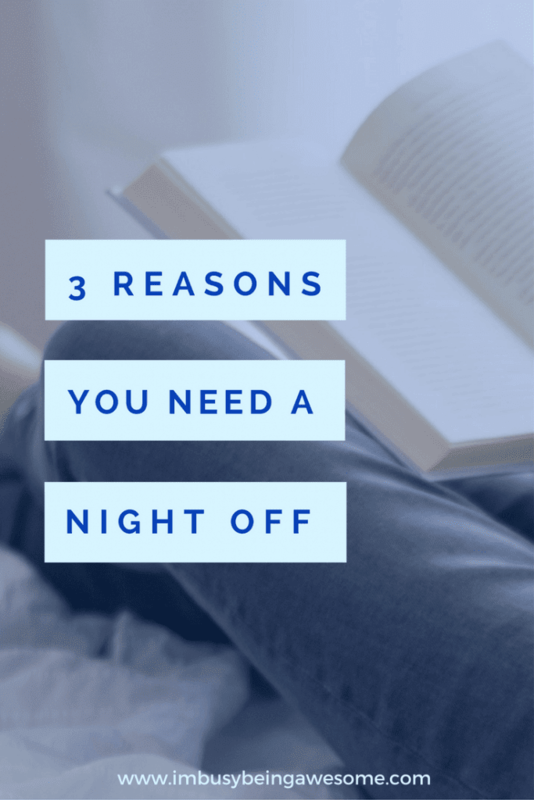 So when you see this post titled, “3 Reasons why you should take the night off,” it may seem – at first – a bit contradictory. But guess what; it’s not! Rather, taking the night (or day) off is absolutely key in enhancing your productivity. In fact, spending time relaxing and focusing on self-care, is an essential – and often overlooked secret – to discovering your best, most productive self. If you’re anything like me, you’re constantly pushing yourself to tackle that lengthy to-do list. On top of that, you’re probably juggling a thousand different tasks at the same time (even when you know that multitasking is actually less efficient). Well, it’s no secret that when you’re going non-stop at 100 miles an hour, you’re taxing yourself both physically and mentally. You’re quickly burning through your efficiency fuel, and sooner or later, you find yourself running on fumes. We’ve all had those moments where we just feel low. We are tired, slow to respond, and completely sapped of energy. But you know what? When you’re running on empty, it’s difficult to even call it working. Because this is when you’re prone to make mistakes. What’s more, your pace slows considerably, and (at least for me) it feels like I’m working backwards. This only leads to unhealthy frustration. 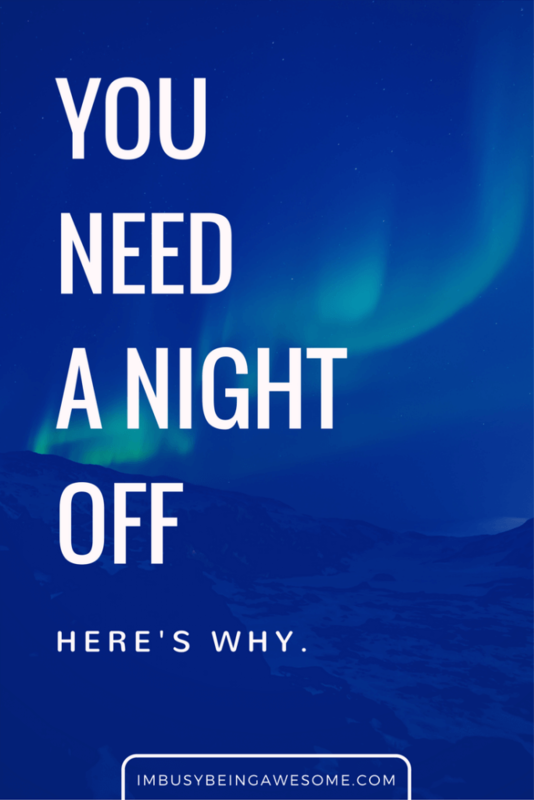 If you regularly schedule a night off, however, you give yourself time to recharge. Think of it like recharging your phone battery. When your phone has reached its limit, you plug it in, leave it alone, and let it recharge. Guess what, you should do the same for yourself. Take a break from your balancing act. Set aside specific times throughout the week, and tell yourself it’s time for you. This way, when you hit a moment of low energy, you can remind yourself of that upcoming break. You know that in X amount of hours, you have an evening of relaxation awaiting you. In fact, this thought alone might provide the extra burst of energy you need to get you through your afternoon slump. I’ve talked about the importance of a good night sleep in earlier posts, and I want to elaborate on it here. Because a key component of having a relaxing night off is turning in early. While you might feel inclined to stay up late by either going out with friends or binging your favorite series on Netflix, I encourage you to think twice. Why? Because one of the healthiest things a night off provides is the chance to catch up on sleep. Make sure you’re in bed and ready for sleep at least 7-8 hours before you need to wake up. What’s more, you should make your sleep experience is as comfortable as possible. Close the blinds and eliminate any excess light. Use a fan or a white noise machine if sounds keep you awake. And turn down the heat so your bedroom is at a cool 60-67 degrees. You might even treat yourself to some soft sheets; alternatively, if the time is right, opt for a new bed. Take some time to research mattress details and get the comfiest, most restorative night of sleep imaginable. I promise you, an early night in a cool, comfortable, darkened room, while sleeping in a bed you love, is a surefire way to give yourself a productivity boost. This last reason is simple fact. No one can go at 100% all the time. This is a lesson with which I still battle today; I’m constantly reminding myself that everyone needs a break. So I hear you. Really, I do. You might think you can thrive on 4-5 hours of sleep per night. Perhaps you believe that you’re maximizing productivity by using every ounce of your energy day in and day out. But here’s the hard truth. You can’t, and you’re not. Sure, this fast-paced lifestyle might be fine every once in a while. But a consistent schedule of “go-go-go” is simply unsustainable; what’s more – and I speak from experience – you might burn yourself out. So long story short, please take a break. Give yourself a night when the only thing that matters is YOU. Dedicate time to your comfort, your relaxation, and your happiness. And your productivity levels will thank you. 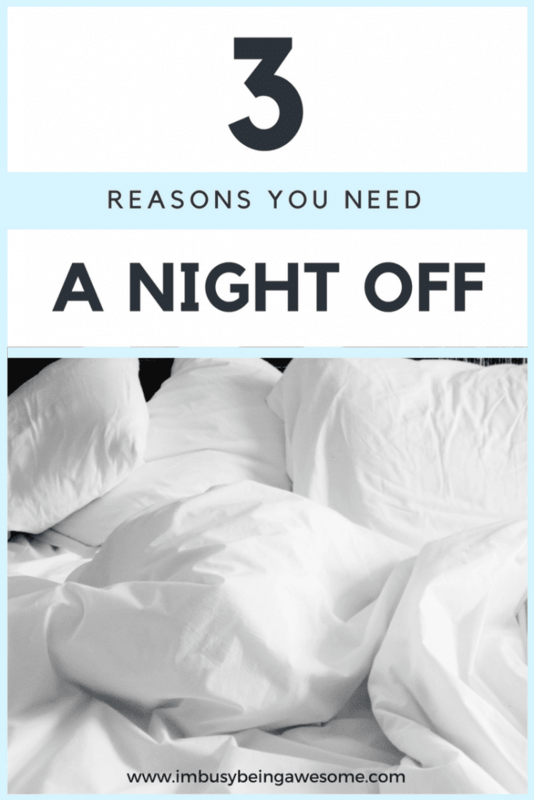 Do you struggle with taking a night off? How do you practice self care? How do you ensure getting enough sleep each night? I’d love to know – let me know below! OMG you’re so right! I’ve been so busy all this week I felt like quitting everything cause I couldn’t take any more. I’m so glad it’s weekend. I will finally have some time to rest and restart my brain. World’s #1 procrastinator here… these are great tips! I definitely need to take the one about bedding to heart — my sheet wasn’t even tucked in on my bed properly last night and it was such a bad nights sleep, haha. Lesson learnt! Ha! I hate it when my bedding is all messed up. It’s so uncomfortable!